The BSR20, BSR30, and BSR40 are 3-Point Cat 2 or Cat 3 Bale Spears for moving large, heavy, round or square bales. All three models feature a 4” x 4” square tube for strong single-beam construction, 3/8” plate steel for the top link, 1/2” lower 3-point lugs, and 49” forged steel spears (44” usable). Our BSR20 is 45” wide with two spears; BSR30 is 60” wide with 3 spears; BSR40 is 96” wide with 4 spears. The BSR30 has options for 32” or 39” spears in sets of 3, all the same length. The BSR20 and BSR30 have a lifting capacity of 3,000 lbs and the BSR40 has a lifting capacity of 4,000 lbs. Cat.II & Cat. III 3-Point hitch: Works well with a lot of tractors. Quick Hitch compatible: Easy to hook-up and unhook with a Quick Hitch. Bale Spear must be supported on blocks to use the Quick Hitch. Replaceable spears: Spears are easily replaced if damaged. Bales can be pushed with multi-spears: Good for pushing bales onto side dump trailers. Spears punch holes in end of bale, not in the circumference: Very little moisture can enter the bale where the spears punch. Grappling type bale lifts punch holes in the circumference allowing moisture to penetrate the bale and accelerates bale deterioration. 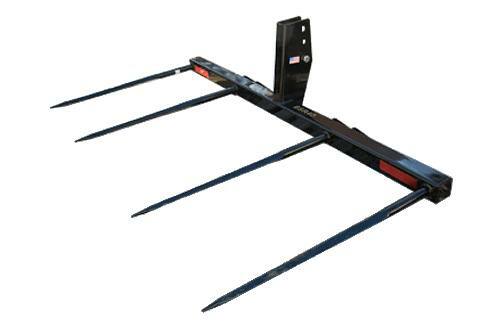 BSR20 features two spears: Increased lift capacity and stability when lifting a single round bale. Frame lift capacity 24" from face of frame: 1 - Round bale up to 3,000 lb. Quick Hitch Compatible: Yes, if Bale Spear is supported on blocks. Spear overall length: 49 in. Spear probe length Face of frame to end of point: 43 3/4 in. Weight of unit: 152 lb. 1 - Round bale up to 3,000 lb.